The force of moving water creates energy in hydropower plants. Hydropower is energy produced from the force of moving water. This force can be extremely powerful and is driven by gravity. Hydropower plants use this energy to produce electricity. Hydropower comes from the Greek word "hydro", which means "water". The energy in hydropower comes from the force of moving water. The Water Cycle is a continuous natural cycle that involves the fall and movement of water. The sun's energy evaporates water from oceans and rivers, drawing it upwards as water vapour. As the water vapour rises and reaches cooler air, it condenses and forms clouds. The moisture in the clouds eventually falls back down to Earth in the form of rain or snow, replenishing the water in the oceans and rivers. Water movement is created by gravity as part of the natural Water Cycle. What causes water to move? The reason that water moves from high ground to low ground is due to gravity, which drives the movement of water. The force of moving water can be extremely powerful. Moving water turns the turbines that generate electricity. 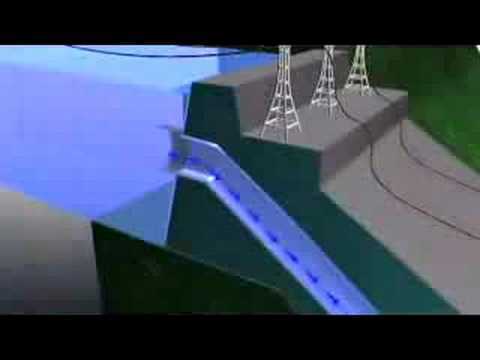 How is hydropower converted to electricity? Hydropower is used to generate electricity in hydropower plants. What affects the amount of electricity that can be generated in a hydropower plant? This is determined by two factors: head and flow. Head is how far the water drops. Picture it as the highest level of the water in the dam, to the point where the water enters the power-producing turbine. Flow is how much water moves through the system – the more water, the higher the flow. Generally, a hydropower plant with a high head needs less water flow than a plant with a low head to produce the same amount of electricity. Rain water can be stored and released in drier months to create energy. Hydropower is energy thatcomes from the force of moving water. Hydropower plants convert the energy in moving water to electricity. The Water Cycle is a continuous natural cycle involving the fall and movement of water. Evaporation is the process of liquid turning to gas. the Sun evaporates water (liquid) from the oceans and rivers and turns it into vapour (gas). Condensation is the process of gas turning to liquid. As it cools, water vapour (gas) turns to moisture (liquid) to form clouds. Precipitation is when rain, snow or sleet falls to the ground from clouds. Rain from a "wet season" can be stored in reservoirs and used to generate power in dryer months. The turbines in hydropower plants move slowly enough to allow fish to pass through unharmed. The Three Gorges Dam in China, is the world's largest power station in terms of installed capacity (22,500 MW). Hydropower is energy that comes from the force of moving water. This energy is used to generate electricity in hydropower plants. The movement of water is driven by gravity.